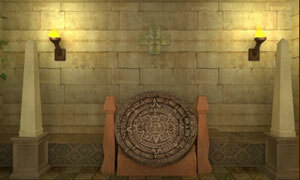 Mystery Temple Escape is point and click, escape game by flash512. You're locked in a mystery temple room and must find some useful objects to help you resove puzzles to escape. Your friend, an archeaologist, got an old map accidently. He invited you to explore it with him. When you entered the stone room, you go separated. It looked like a temple of an ancient prophet. The door was closed. Now the only way escaping out is to use any object you can find and uncover the mystery. Good luck and have fun.